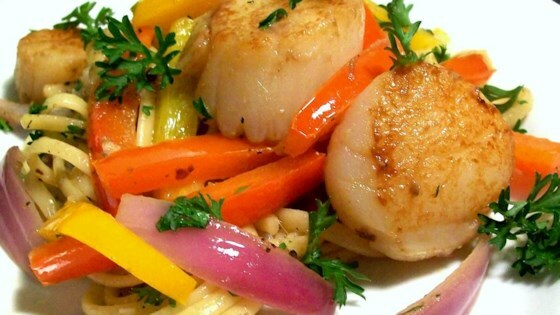 "Scallops are one of the most delicious foods if seared properly, and the addition of peppers and onions complements them quite well. Serve with couscous or rice for a delicious meal." Heat the olive oil and minced anchovies in a large skillet over medium-high heat, stirring as the oil heats to dissolve the anchovies. Once the anchovies are sizzling, add the sea scallops, and cook without moving the scallops for 2 minutes. Meanwhile, toss red bell pepper, orange bell pepper, red onion, garlic, lime zest, and lemon zest in a bowl; season with salt and pepper. Sprinkle pepper mixture onto the scallops and continue cooking until scallops have browned, about 2 minutes more. Turn scallops, stir the pepper mixture, and continue cooking until the scallops have browned on the other side, 4 to 5 minutes. Garnish with parsley sprigs to serve. This was excellent. I didn't have anchovy oil so I added some bacon instead. I served it with angel hair pasta which I seasoned with butter and garlic salt. I will definitely make this again! This was soooooooooooooo good, and better yet, QUICK & EASY!!! I served it over angel hair pasta tossed in garlic and EVOO...all I can say is...YUMMMMMMMM!! !